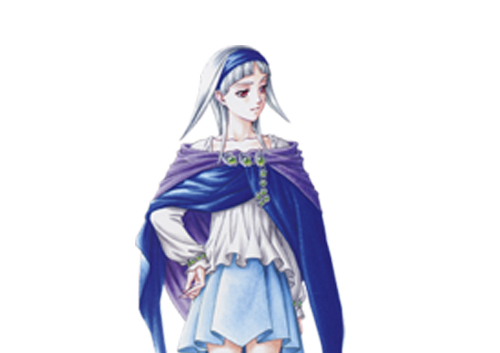 Centuries have passed during after we last saw Sierra Mikain in genso Suikogaiden 2 which happened in IS 462. The bearer of Blue Moon Rune, one of the twenty seven True Runes has traveled across the land and back to Toran Republic during the period leading to Masculine War. She ended up in the Moonlight Village, after hearing rumors of the passage to the moon. Sierra arrives on the Moon where she encounters a community with humans very pale and fair. She builds the second Village of the Blue Moon and resides there. As her gratitude towards Hou Yi and Feng Meng, appoints Wu Gang, the carpenter to assist the generation of the Moonlight Village. During the Masculine War, she assists the Archery Department led by Hou Yi and Feng Meng, men from her village. After Hou Yi's death, she brings his corpse to the Moon and bites him, turning him into an immortal. Eventually, Feng Meng joins the two and the three becomes the leader of the Blue Moon Village.